We are Coventry & Warwickshire’s specialists in Plus-size bridal gowns. Our staff have extensive training, so we are the absolute best people to advise curvaceous Brides on the styles and designs that will best suit them. We carry a range of beautiful gowns to flatter your curves and enhance your silhouette. 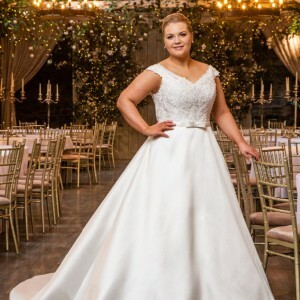 We select our Plus-size gowns from collections by Special Day & also Silhouette by Romantica of Devon, both specialists in creating stunning gowns for curvy girls. We also carry Bridesmaids dresses in stock up to a size 28.